Around 4:15 yesterday on the Quad, I noticed a small red thing sitting in the grass, nearly dead center of the Quad. From a distance, it looked like a small statue. Upon closer inspection, it looked a bit like a pinata (with the same kind of colorful, loopy paper strips). 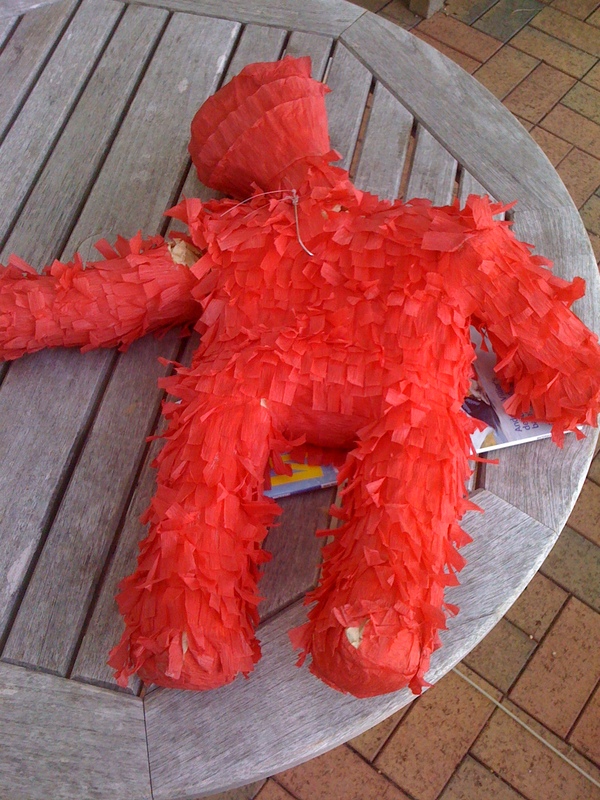 I don’t know if he was part of some art student’s final project or a homemade pinata for Cinco de Mayo, but he was holding court in the grass. As I walked into work this morning, Red Man had moved over to a table outside the Post Office, and appears to have had an unfortunate run in with something, as his left arm is detached. If your student knows what Red Man is for, you can email parents@nullwfu.edu and give us the scoop. Finals ended yesterday for undergraduates. Residence halls close this evening at 7 pm for first-year and upperclass students who are not participating in commencement activities. And while your students will be home this summer, we hope you’ll still visit the Daily Deac blog and the Parents’ Page of the web site throughout the summer. We’ll continue to keep you apprised of news and information from the campus.